My family cooks everyday. My mother goes to the market almost daily to get fresh produce. We have slow-boiled soup often and make our own fermented food like kimchi from scratch. While homemade food is staple, fast food is like a treat. We love our McDonald's and KFC, and enjoy our sundaes, fries, and crispy fried chicken. The secret lies in the type of cheese that we use. 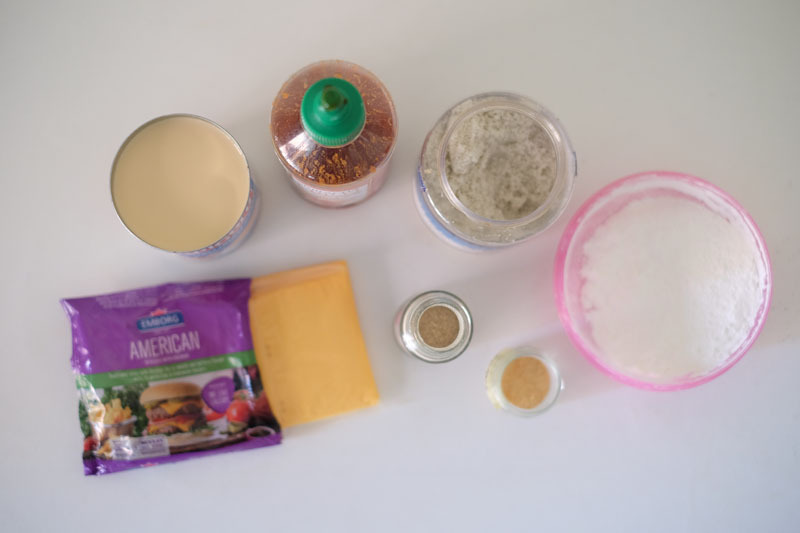 I was using all types of cheese and found that sliced American cheddar cheese works best. Any other cheese will not be the same. The next secret? Garlic powder. This natural seasoning makes food as flavourful as commercially made ones. 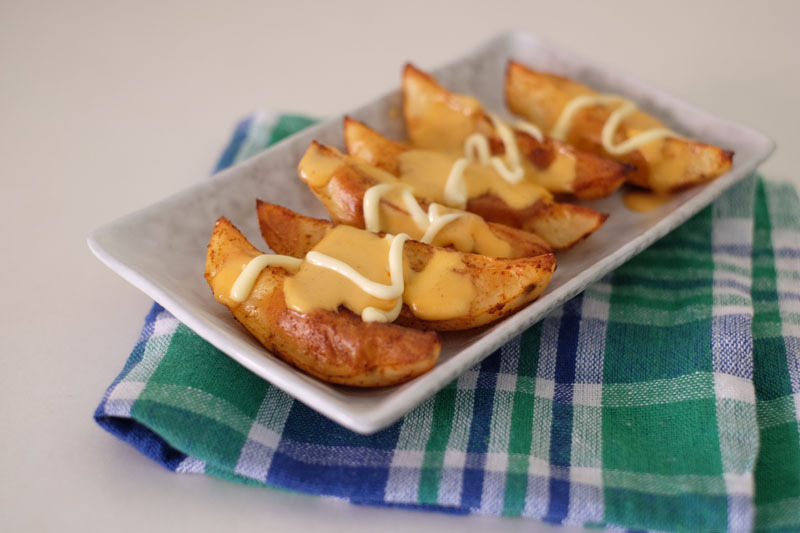 So, here you go, a recipe that taste much like KFC cheesy wedges we so love! Step 1 SLICE & SEASON POTATOES: Peel potatoes and slice into wedges. 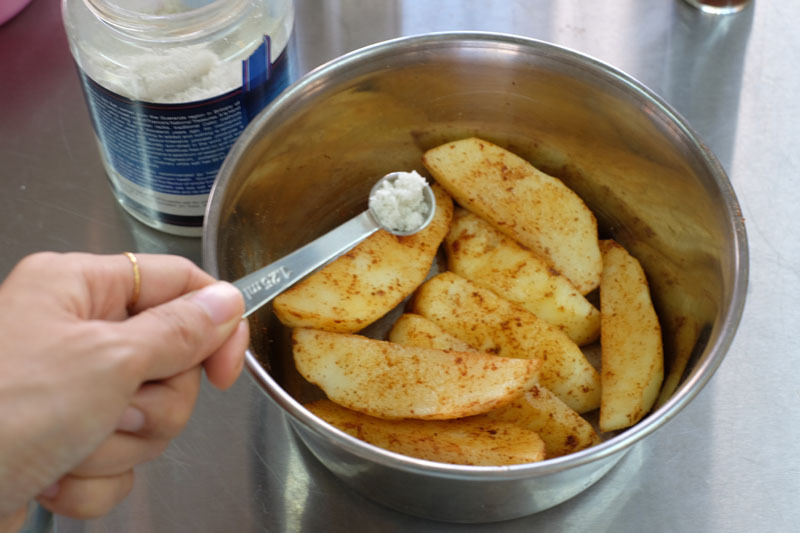 Place into a mixing bowl and season with salt, paprika, pepper, and oil. Toss to combine. Step 2 BAKE POTATO: Line baking tray with aluminium foil. Place potatoes in one layer and baked at 200°C for 30 minutes. Step 3 TEAR CHEESE: Tear cheese into small pieces into a pot. Add cornstarch. Toss to combine. 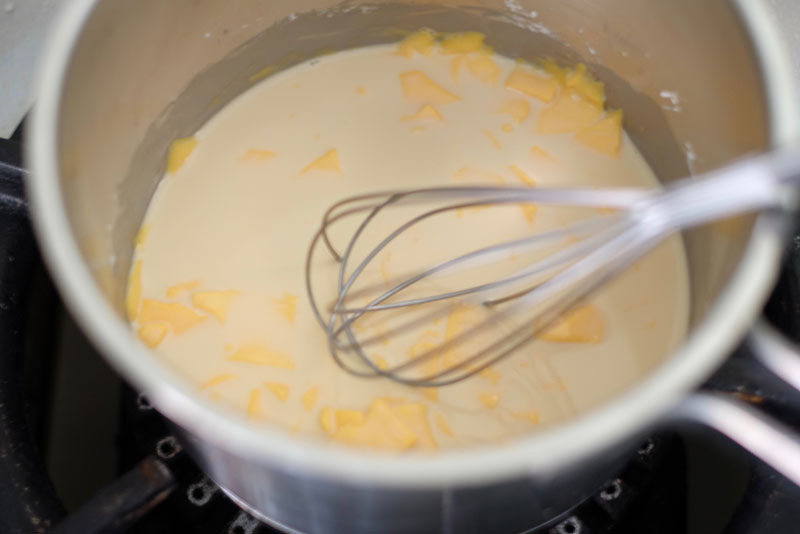 Step 4 ADD MILK: Add 1/2 cup evaporated milk into the pot. Step 5 COOK: Cook over low heat, stirring constantly with whisk until melted, bubbly, and thickened (about 5 minutes). Mixture will look thin at first but will thicken after heating. Step 6 SEASON: Season with chili sauce, garlic powder, white pepper, and salt. 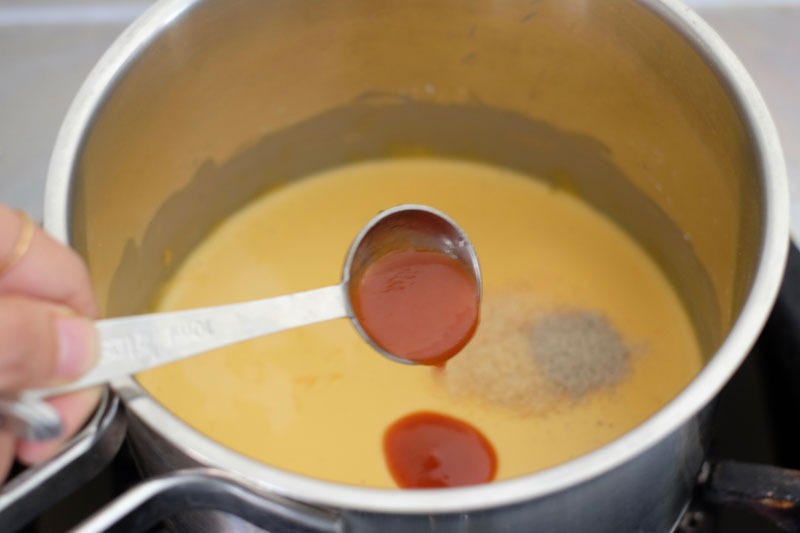 You may want to, thin to desired consistency with additional evaporated milk. Step 7 SERVE: Pour cheese sauce over baked potato and drizzle with mayonaise. CHEESES SAUCE: Tear 5 slices of American cheddar cheese. Add 1/2 tbsp corn starch + 1/2 cup evaporated milk + 1/2 tbsp Sriracha hot sauce. Cook on low heat & whisk for 5 min until thicken. Season with 1 tsp garlic powder + 1/2 tsp white pepper + 1/4 tsp salt. 1. 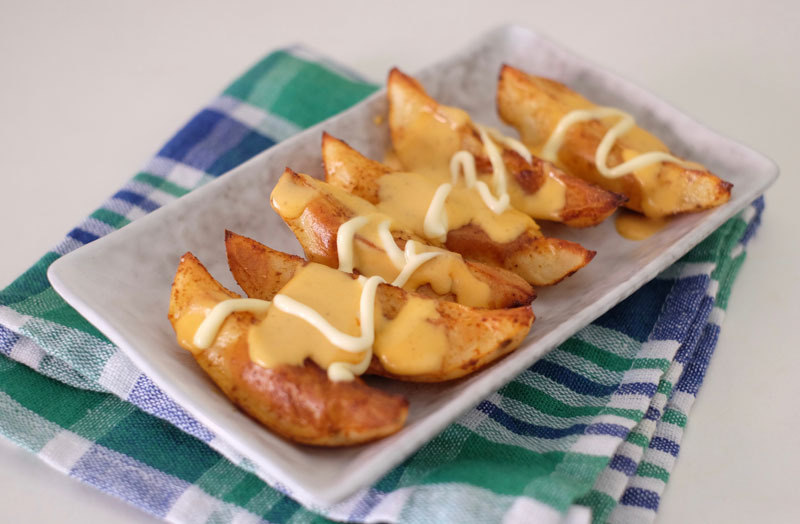 SLICE & SEASON POTATOES: Peel potatoes and slice into wedges. Place into a mixing bowl and season with salt, paprika, and pepper. Toss to combine. 2. 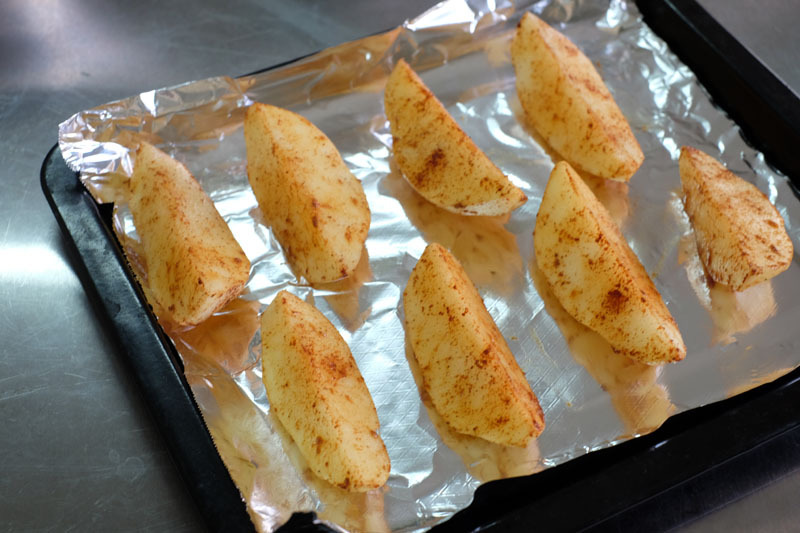 BAKE POTATO: Line baking tray with aluminium foil. Place potatoes in one layer and baked at 200°C for 30 - 40 minutes. 3. 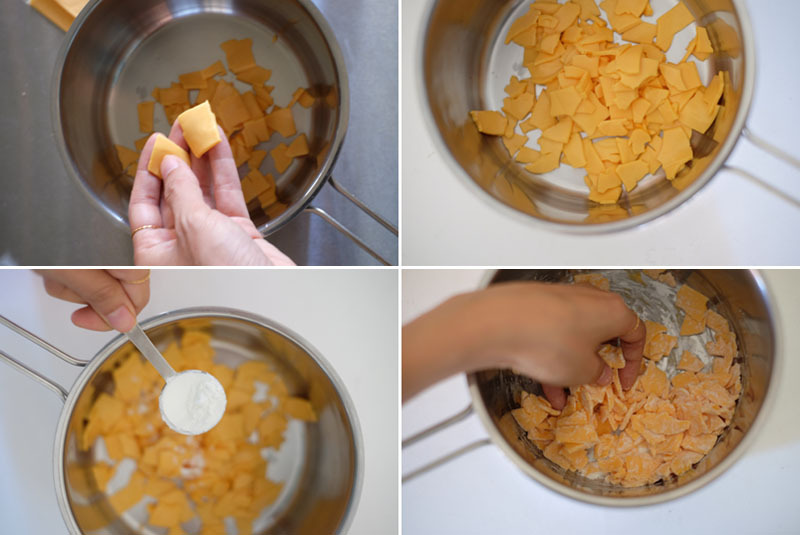 TEAR CHEESE: Tear cheese into small pieces into a pot. Add cornstarch. Toss to combine. 4. 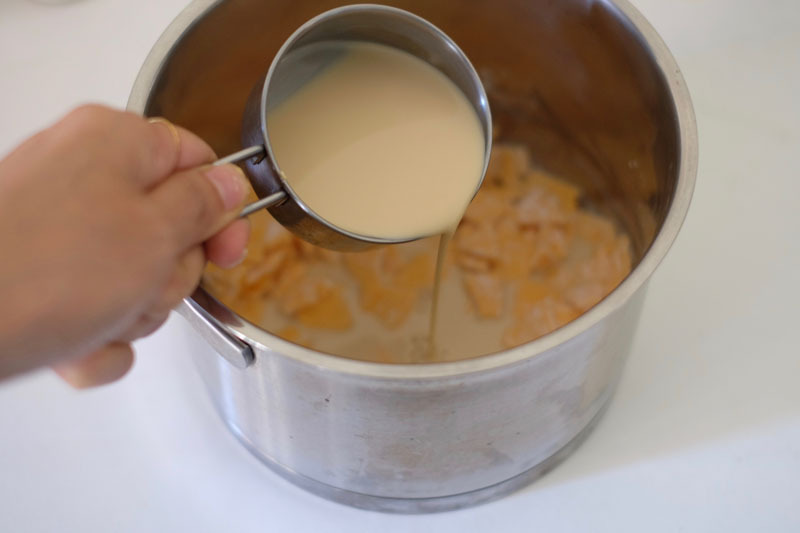 ADD MILK: Add 1/2 cup evaporated milk. 5. COOK: Cook over low heat, stirring constantly with whisk until melted, bubbly, and thickened (about 2 minutes). Mixture will look thin at first but will thicken after heating. 6. SEASON: Season with chili sauce, garlic powder, white pepper, and salt. You may want to, thin to desired consistency with additional evaporated milk. 7. 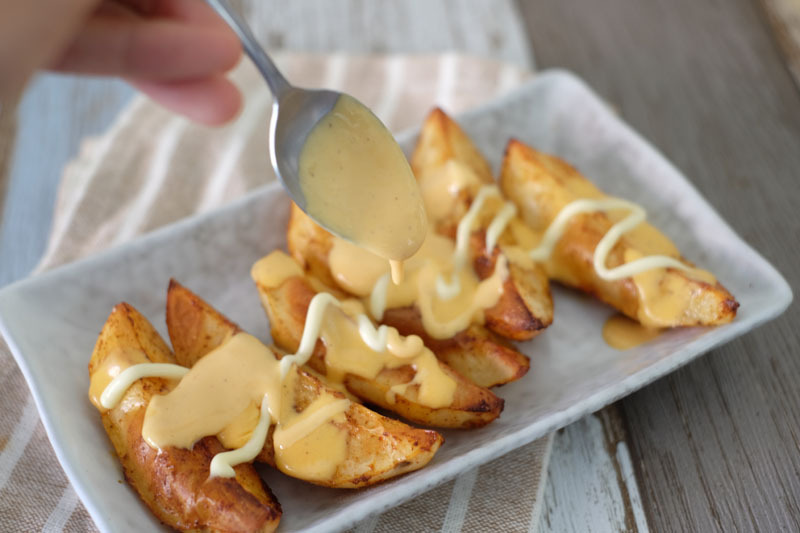 SERVE: Pour cheese sauce over baked potato and drizzle with mayonnaise. Sliced American Cheddar Cheese You have to use this cheese. I found that sliced and grated cheese tastes different. Refrigerate You can refrigerate the cheese sauce for a few days. I've tried it without much trouble. However, I suggest that you don't keep it more than one day. It's a great recipe to bring to a party. You can pour the cheese sauce over anything - sausages, pasta, or even vegetables like broccoli. I served it to my friends with some homemade nuggets and all of them love it. Try it at your next potluck party!